This year I have been the person who’s skipping around singing Christmas tunes all day, usually making up my own lyrics, which I think are probably way better. My house on the other hand, isn’t quite caught up to my festive spirit. I still haven’t gotten lights up on our Christmas tree…which isn’t even a Christmas tree, it’s actually a dogwood plant…it fits the size of my house. The Christmas lights are totally Andrew’s fault, as he stole them from me to use somewhere else, and has yet to return them. Ugh. That being said, even without the sparkly lights, my kitchen has been in full holiday swing! My mission: Make something that those turkey eaters will be jealous of! Not only did I need to make this an awesome, hearty, drooly entrée… (the onlookers drool, not the entrée)…but I also wanted it to be fuss free!! The holidays are so busy, as if you need to be burdened by a super complicated recipe. I can see it now… guests are arriving, you’re hugging and kissing them, passing appetizers around, you have a cocktail in hand while you are stirring the pot in your adorable apron. Oh wait, you missed super important complicated step 57 of 103 steps!? Recipe ruined! None of that business here. 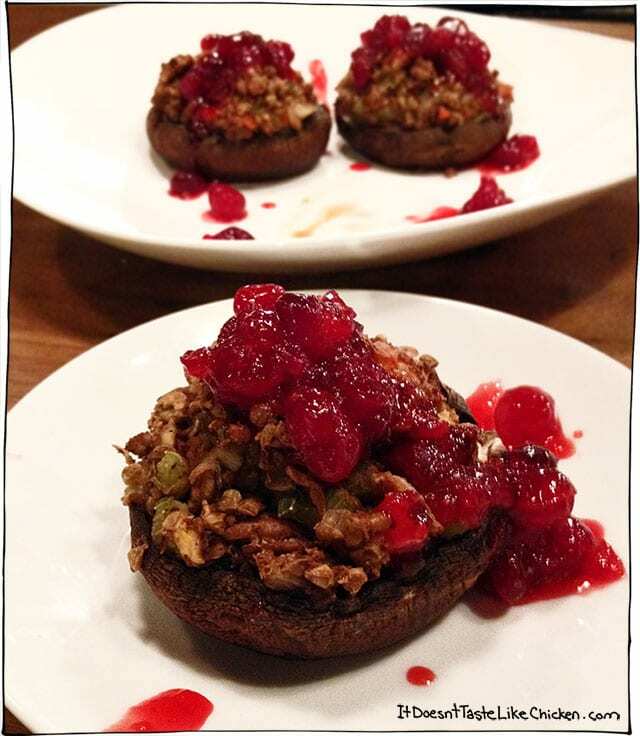 These Holiday Stuffed Portobellos are very easy to make. You can make the stuffing for the mushrooms and the Vanilla Bourbon Cranberry Sauce a day or two ahead, and you can even stuff the mushrooms the day before, so all you will have to do is pop them in the oven for 30 mins. You’re welcome. Inspired by a recipe by one of my favourite chefs, Chloe Coscarelli, and another great recipe by Oh She Glows. 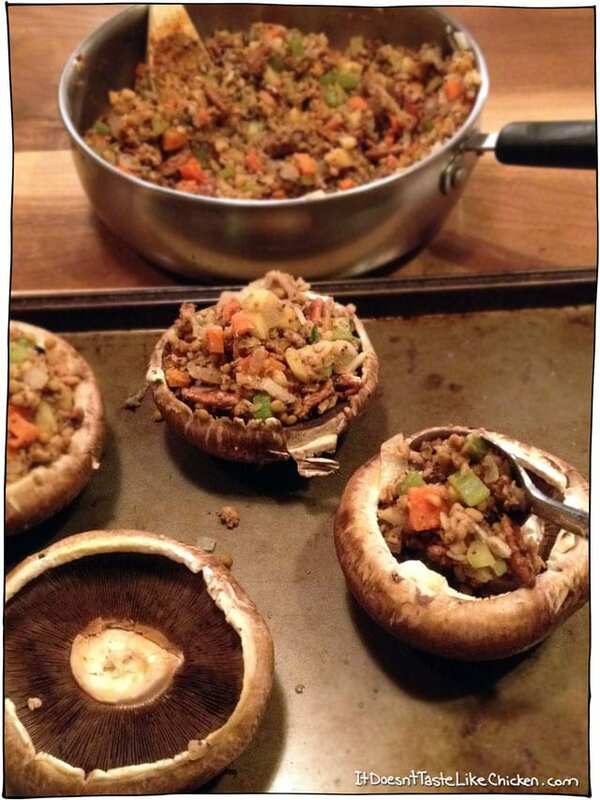 Makes 6 servings (6 stuffed large portobello mushrooms). Or for a side dish you can buy the small portobellos and it will make about a dozen. 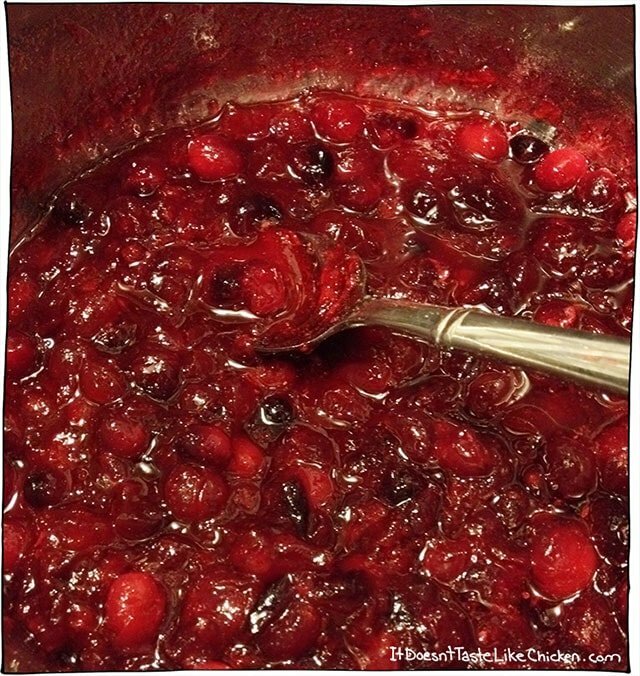 You will want to make the cranberry sauce first as it needs some time to cool and thicken. 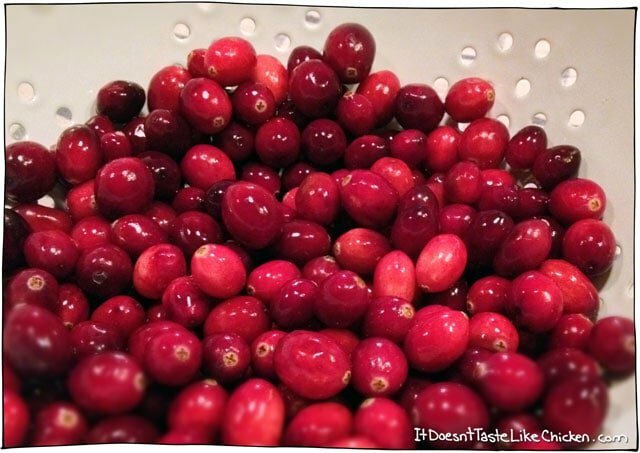 Rinse your fresh cranberries, and admire how bright and colourful they are…ooooohhh, ahhhh…. so festive! Toss them into a sauce pan along with the bourbon, sugar, lemons zest, vanilla bean, and water. Stir, and bring to a simmer, and cook for 10-15 minutes ish. The berries will start to pop open, and become saucy. Once your sauce looks something like this. It’s done! Remove from the heat. It will be pretty thin, but don’t worry, as it cools it will thicken up. 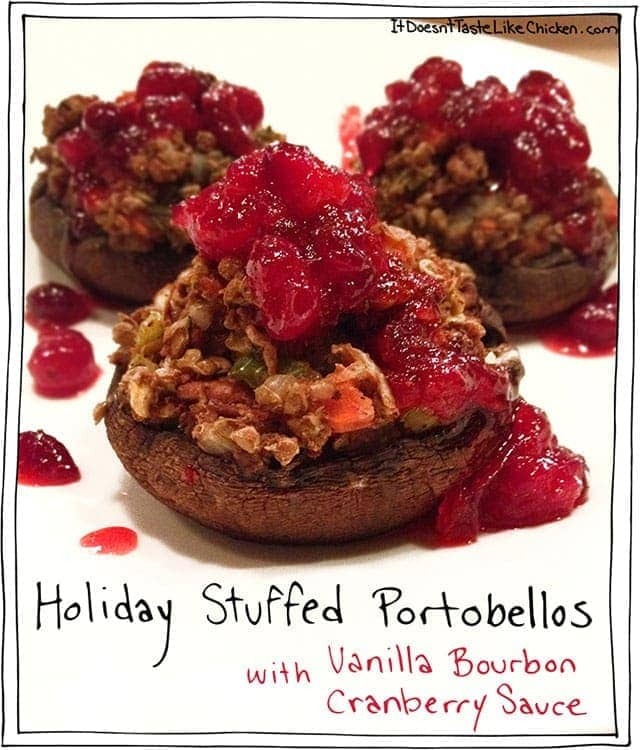 Now, moving on to the Holiday Stuffed Portobellos. Prepare those veggies. Peel carrots and the apple. Chop the onion, celery, carrots, and apple into an even-ish size. Finely chop the garlic. Remove the thyme leaves from the stems, by sliding your fingers down the stems. Roughly chop the pecans leaving some whole. Drain and rinse your lentils. This is a pretty quick recipe to pull together so you want all your ingredients prepared. Add a glug of olive oil to the pan and over medium high heat, sautee the onions for 3 minutes or so until they begin to turn translucent. 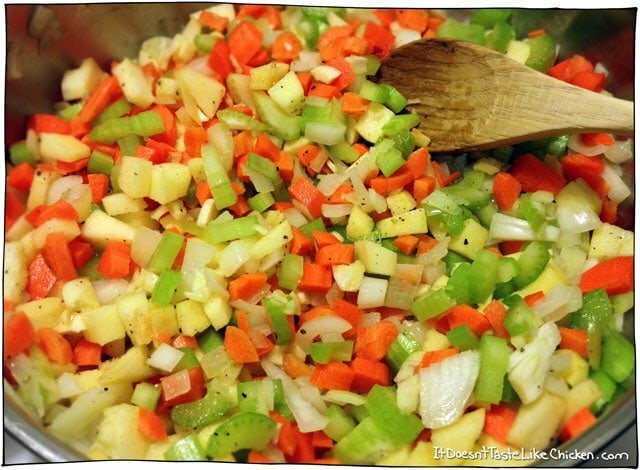 Add the celery, carrot, apple, and garlic, and season with a bit of salt and pepper. Cook for around 5 minutes, it will smell pretty delish. Then turn off the heat. See told you that was fast! 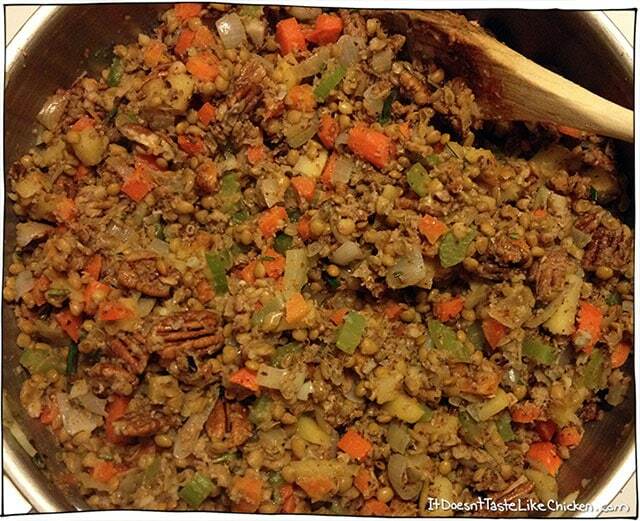 Add the pecans, lentils, breadcrumbs, thyme and stir it all in. Stuffing done. Now take your potobellos and cut out the stems., so you have a nice mushroom bowl for your stuffing. Lightly brush each portobello with olive oil on both sides. Fill your portobellos, and lightly pack the filling in. Build it up so you get some nice height. Bake for 30 mins. The filling will be lightly browned, the portobellos will be cooked, and juices will be running. 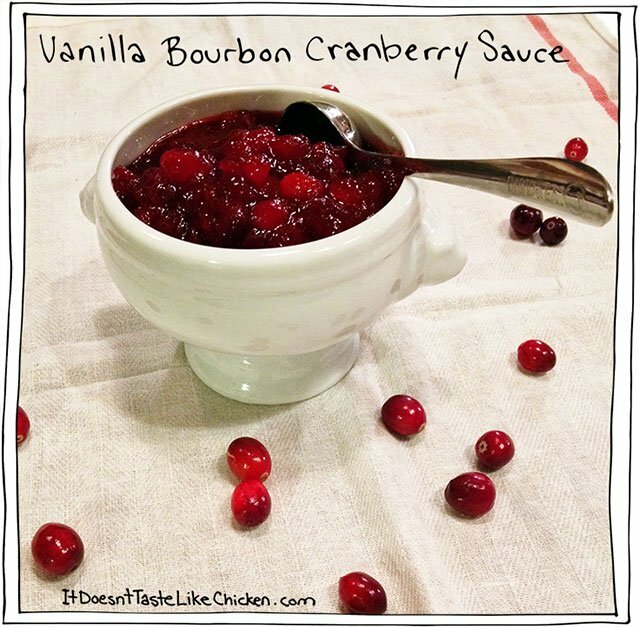 Serve with cranberry sauce and admire your delicious handy work. Bon Appetegan, and Happy Holidays! Oh my goodness Sam! These are fantastic! I added 1tbspoon if ground sage ( the smell and flavour screams Christmas to me). I had to add some soup stock because of the kind of crumbs I used but it’s all good! Thank you, thank you, thank you for this recipe! Yes, it is not the 25th, yet. I am keeping the stuffing and mushrooms separate until then. Delicious! Will definitely be sharing the recipe, as usual! Now to make the pumpkin pie! No cooking for me on the 25th! Amazing! Thrilled you loved them, Karen 🙂 Merry Christmas! I just made these as a late-night dinner for one- with 2 caps! Had to make a few adjustments because of what I had in my kitchen. Mung beans instead of lentils. Cointreau & J&B instead of vanilla and bourbon. Frozen cranberries. 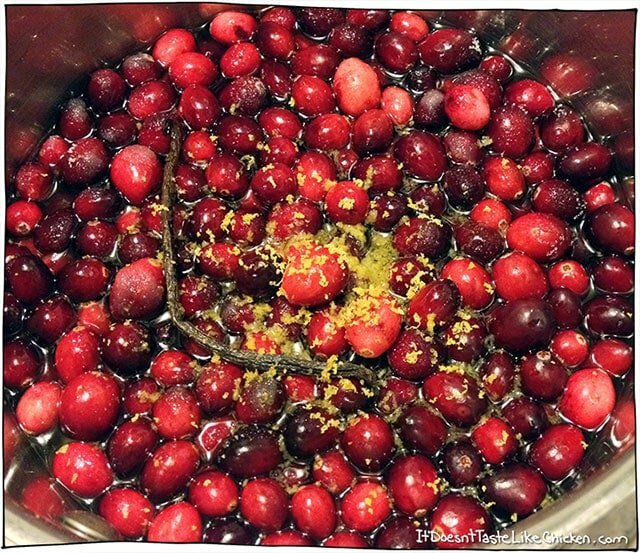 Added lemon juice to make the cranberry sauce tangier. Almonds instead of pecans. Broiled the mushroom caps a bit while making the stuffing because I didn’t want to have to bake them for so long- it’s late and I’m hungry! This may or may not have made any difference. What remained was a super satisfying dinner and left over stuffing for tomorrow. I would like to figure out how to make the stuffing stick together more. The crumbliness made it a bit difficult to keep it all in the cap. I added extra olive oil but it didn’t quite do it. Maybe I should have just added water! Didn’t think of that… Regardless, this is a perfect meal to go with my Heineken and watch some Parks and Rec before bed. Thanks Sam! Your recipes have never failed me! Haha! So glad you enjoyed your rush holiday meal, and on a non-holiday! Hey, why not celebrate? Love it. I didn’t problem with the stuffing sticking together, I find it very pack-able. Maybe that is the difference between mung beans and lentils? Sounds like an awesome night! Next time invite me over and pass me a Heiny! haha. Samantha, these are great! 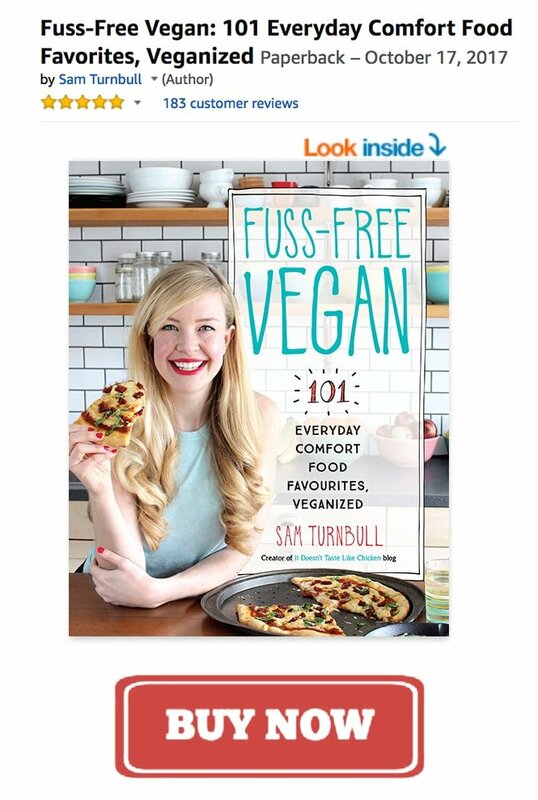 Thanks for making our vegan Christmas yummier!